If there was one group of villains I wish I had incorporated when I GMed D&D & Pathfinder a few years ago, it would have been vampires. I was always intrigued with the gothic elements associated with the undead. But at the time, I was more interested in extradimensional creatures, corrupt politicians, warring guilds, elven armies and goblins playing havoc with my players in the fantasy setting. As I was beginning to draft the outline for my Numenera campaign The Paranoid Automaton, I knew right away I wanted to include a variety of groups that the players could encounter, one of them being a weird take on vampires in style and tone, but not necessarily in origin. The Falkir as presented in the game are light blue humanoids with glowing yellow eyes who happen to enjoy snacking on human blood from the Ninth World for their survival, and have numerous enemies who view them as evil because of their natural appearance and tendencies. I know I’ve read somewhere (it may have been an interview with Monte Cook or in the corebook) that the traditional undead as we’ve come to know them don’t exist in Numenera. The Falkir are not the undead. In my campaign the players have the opportunity to run into people or humanoids who have heard about The Falkir’s alleged origins, which in the game will always be second-hand information that conflicts with information provided by other sources. But it’s information that stays true to the nature of Numenera. Whether the strange humanoids are experiments, mutants, aliens, dimensional beings, constructs or a mixture is left ambiguous in the campaign. In the game, players are given the opportunity to ask one of their Falkir hosts questions regarding other lifeforms beneath the City of Fallenstar where The Falkir and a multitude of other beings call home. The Falkir host tells a short story about gentle and graceful beings who came to this world after their home was destroyed in a cataclysmic event. They lived underneath the planet for ages, but nearly a century ago another event, which they could not escape this time, befell them and changed them forever. The host does not make it clear if the aliens who came to this world were The Falkir, or if it was they who caused the aliens to change and bring about a new enemy to the Ninth World. Not left into question is in what capacity do The Falkir pose to the players. In this aspect, it’s pretty clear-cut depending on the players’ decisions. The players have a number of choices throughout the game which will either lead The Falkir to becoming an asset or not. Plant of the Vampires movie poster and Evi Marandi playing one of the crew members of the doomed spaceship, the Argos. 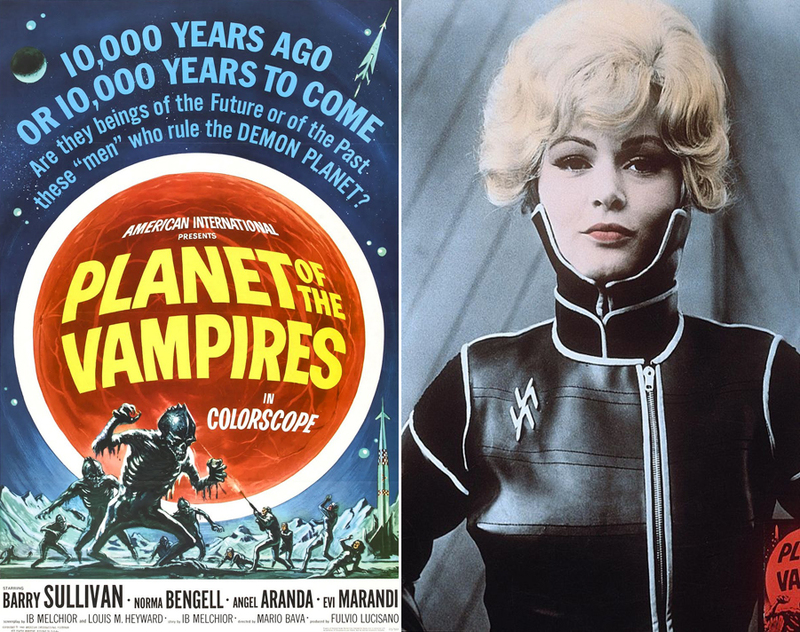 In fleshing out the weird elements of The Falkir, one source of inspiration came from the 1965 gothic science fiction movie Planet of the Vampires. The movie takes place in the future where two spaceships travel to a planet which is emanating a distress signal. When the ships arrive close to the planet, chaos ensues with the crews inexplicably attacking each other and eventually killing each other off as alien beings become hosts to the dead crew members. At one point, the aliens reveal that they lured the spaceships to the planet so they could escape from their dying world. There are parts in the movie, especially in the middle, where it drags a bit. The gothic tone of the movie is pretty good and the cinematography (for the time) is excellent. The ending is similar to what one might expect from the Twilight Zone. Planet of the Vampires has been cited many times as being a major influence for the films Alien and Prometheus, which is pretty undeniable given the designs and plot (There’s even a scene in Vampires where a few of the astronauts find an old spaceship on the planet and find a giant skeleton. The scene is exactly like the one depicted in Alien. ).